This sylish, modern girl's dressing table comes with exemplary craftmanship and finishing features. It is complimented with a large, heart embellished mirror, 2 jewellery drawers and a large centre storage drawer. It is perfect for storing your child's jewellery, makeup, hair accessories and other trinkets and the smooth glossed tabletop provides additional space for your child's personal possesions. Complimenting the children's dressing table is a matching white glossed wooden stool that sits perfectly beneath the dresser when not in use. This vanity dresser is the perfect furniture for your child's bedroom and it's contempary design will ensure your child feels like they are special. 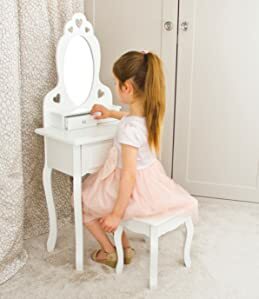 Every child dreams of having a glamourous kid's dressing table where they can spend endless hours dressing up and experiencing a make believe fantasy. 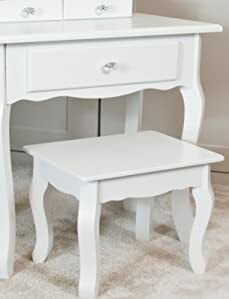 This kids vanity table dresser has been constructed using hardwood and MDF, resulting in a strong and durable vanity dresser that will easily withstand the excited temperament of young children. Finished in a neutral, non toxic white gloss, you can be confident that your child will be safe and sound whilst using this vanity dresser. 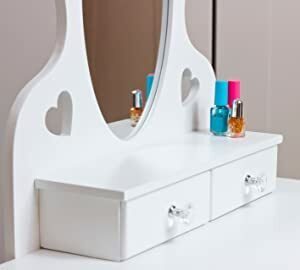 This is a stunning white girls dressing table with a complimentary heart embellished mirror. Your child will simply love this beautiful design enabling them to look and feel their best. A large central drawer and 2 smaller drawers located on the kids vanity table will provide ample storage space for your child's possessions. 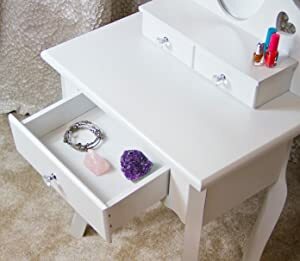 Whether it's hair accessories, jewellery or makeup, you can be confident that this small white dressing table will store them safely, securely and keep your child's room tidy. 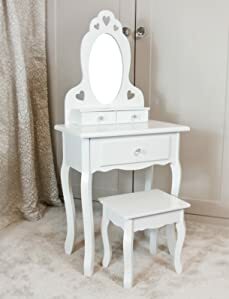 Accompanying this kids vanity table is a stylish stool. This stool has been carved with loving care and fully matches the aesthetic appeal of the vanity dresser.